PEST Analysis is a strategicStrategyCorporate and business strategy guides. Read all CFI articles and resources on business and corporate strategy, important concepts for financial analysts to incorporate in their financial modeling and analysis. First mover advantage, Porter's 5 Forces, SWOT, competitive advantage, bargaining power of suppliers framework used to evaluate the external environment for a business by breaking down the opportunities and threats into Political, Economic, Social and Technological factors. PEST analysis can be an effective framework to use in Corporate Strategy PlanningCorporate StrategyCorporate Strategy focuses on how to manage resources, risk and return across a firm, as opposed to looking at competitive advantages in business strategy, useful in identifying the pros and cons of Business Strategy. 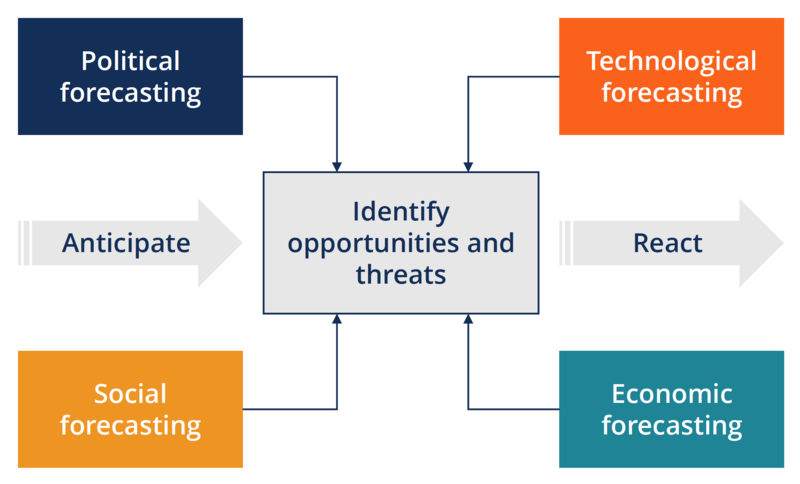 Below we break down the key items of each of the 4 Factors of PEST(Political, Economic, Social, Technological). From CFI’s Business & Corporate Strategy Course. One of the reasons that elections tend to be a period of uncertainty for a country, is that different political parties a have diverging views and strategies for policy on the items above. The P in PEST analysis stands for Political! Economic Factors take into account the various aspects of the economy, and how the outlook on each area could impact your business. These economic indicators are usually measured and reported by Central BanksEuropean Central BankThe European Central Bank (ECB) is the central bank for all the European Union (EU) member states. The body has the responsibility to the euro... and other Government Agencies. Interest Rates Interest RateAn interest rate refers to the amount charged by a lender to a borrower for any form of debt given, generally expressed as a percentage of the principal. The asset borrowed can be in the form of cash, large assets such as vehicle or building, or just consumer goods. Often these are the focus of external environment analysis. The Economic outlook is of extreme importance for a business, but the importance of the other PEST factors should not be overlooked. PEST analysis This is an important aspect of DCF Valuation ModelDCF Analysis Pros & ConsThe discounted cash flow analysis is a powerful tool in a financial analyst’s belt. However, there are many important DCF Analysis Pros & Cons for analysts, discussed in CFI’s Business Valuation Modeling Course. Combined, these four factors have a profound impact on the opportunities and threats for a business going forward. Before creating a business valuation model – such as a DCF ModelDCF Model TemplateThis DCF model template provides you with a foundation to build your own discounted cash flow model with different assumptions. DCF Step 1 – Build a forecast The first step in the DCF model process is to build a forecast of the three financial statements, based on assumptions about how the business will perform in the – it’s important to understand how these factors will impact the company’s ability to generate cash flowCash FlowCash Flow (CF) is the increase or decrease in the amount of money a business, institution, or individual has. In finance, the term is used to describe the amount of cash (currency) that is generated or consumed in a given time period. There are many types of CF. Breaking down the external environment helps identify key elements to be incorporated into your business valuation. PEST Analysis is also useful for company screening, setting criteria that have to be fulfilled for analysis to be considered. If you want to learn more about External Environment Analysis and how it applied to DCF Models and Valuation, take a look at the Business Valuation Model Course, part of the FMVA™ Program!FMVA™ CertificationThe Financial Modeling & Valueation Analyst (FMVA)™ accreditation is a global standard for financial analysts that covers finance, accounting, financial modeling, valuation, budgeting, forecasting, presentations, and strategy.